Recently reading again the essay by Nicolas Bourriaud, Post Production. The culture comme scénario: comment l’art reprogramme le monde contemporain, I have found this excerpt of Mode d’emploi du détournement by Guy Debord, which to the detriment of his fiftyfive years  the text was published back in ’56  picks an extremely contemporary aspect of the artistic practise. Often this practice was associated with the simple sampling, combining the author’s role to the dj’s or producer’s one, for sure basic figures of contemporary culture, who however act in a rather different way, not to say antithetic, compared to the sound artist, semplyfying a lot the process which from the sampling stage takes to the original composition, opting instead for keeping active a sort of quotations process played on new combinations (often we are inclined to leave recongnisable the fragment itself to give more enphasis to the discards, within the inedited system in which it is focused on or inserted). The distinction drawn by Debord between sampling and alteration of the meaning, makes you think instead about those works which structurally conseal the referent (not for omission, but for installation) and build an autonomous process with already existing elements (fragments or entire), which for quality and stratificatioon of the work became part of it, not simply changing their meaning, but formally acquiring a new content. 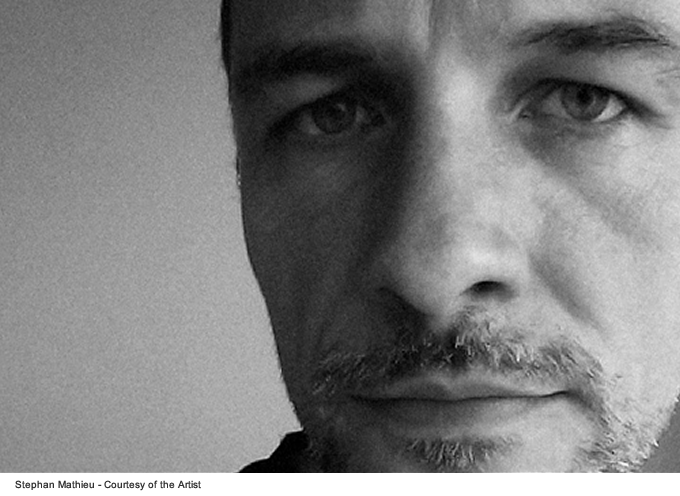 The last two works by the german sound artist Stephan Mathieu  A Static Place and Remain  follow instead this latest process. 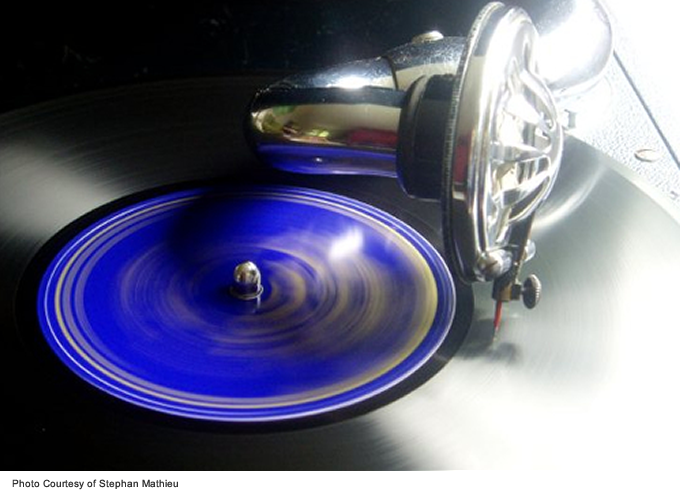 For both of them, Mathieu made use of published compositions of heterogeneous nature: a collection of 78 rpm vinyls of some of the first audio recordings dating back to the 20’s and the score of an installation by Janek Schaefer, Extended Play. Mathieu is not new to reprocessing, tecnique used since a long time to create set ups with instruments and analogical devices connected to hardwares working in real time, but in the last few years his passion for the first discographic recordings, the old instruments, the environmental sounds and the obsolete communication devices, has taken him to experiment new solutions also concerning contemporary compositions. Compared to artists such as Mark Rothko, Barnett Newman e Ellsworth Kelly, Stephan Mathieu’s essential aesthetics strikes for its dynamism and the unquestioned emotional impact, works such as Virginals and Radioland published by the italian Die Schachtel and considered by critics one of the best works of 2008, though relatively recent, are by now rooted in the listener’s contemporary electroacoustic background . Mathieu, on the music scene since the early 90’s, other than many compositions to listen to and excellent collaborations  Kit Clayton, Akira Rabelais, Douglas Benford, Taylor Deupree, John Hudak and many more  dedicated a large part of his practice to the live and visual experience, in which the more intimate dimension of acoustic-mechanical devices moves from the concentration of the isolated sound fragment towards complex performative structures, with a strong architectural matrix. Just to mention the most recent works, the 25th Music Biennale Zagreb commissioned to Mathieu Process, adaptation of the book The Trial by Franza Kafka and of The Trial by Orson Welles, transformed into real time binary code; and in 2010 the Sonar Festival in Barcelona produced three new shows for Constellations at the Planetarium of the Science Museum CosmoCaixa, dedicated to the iberian composer of the Renaissance Antonio de Cabezón, in occasion of the 50th anniversary of his birth, celebrated last year. 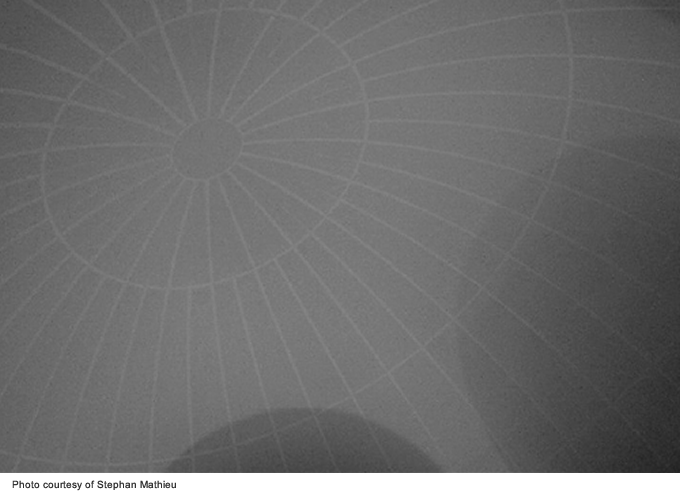 As far as the visual part in conserned, which accompanied Stephan Mathieu, Mikalef and the harpsichordist Carles Budo Costa’s performance, a system of optical lenses assembled with mirrors and colored filters was constructed, enhanced by a spectral bulb system predisposed to create a play on reflections during the projection on the planetarium’s cupola. 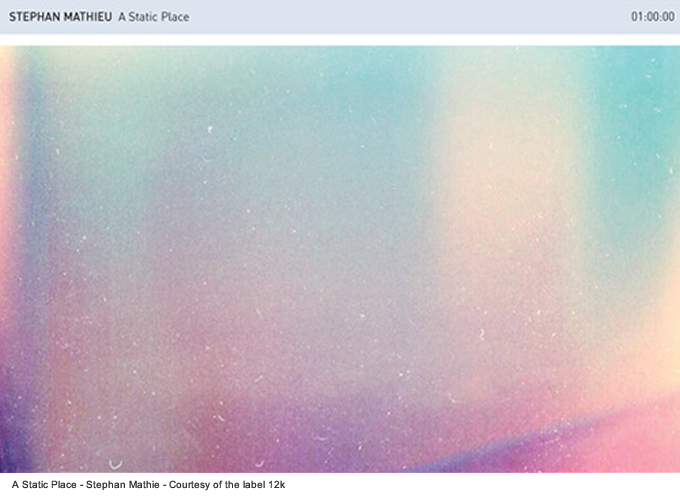 During the 2011 with three records just released – Remain, A Static Place, To Describe George Washington Bridge  Mathieu’s activities has been focusing on a new cicle of concerts for the by now classic Radioland, an on some unreleased productions which will flow into the extension of Virginals. 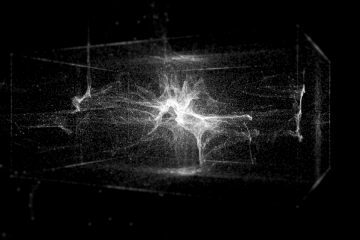 Pia Bolognesi: We can start talking about your latest projects: Remain, on Line, and A Static Place, for 12k, released almost simultaneously from each other. 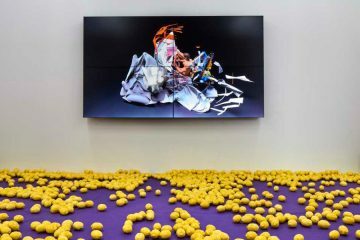 Are these two side projects that arise from a common sound research or in your artistic practice you feel the need to work in parallel on several projects? 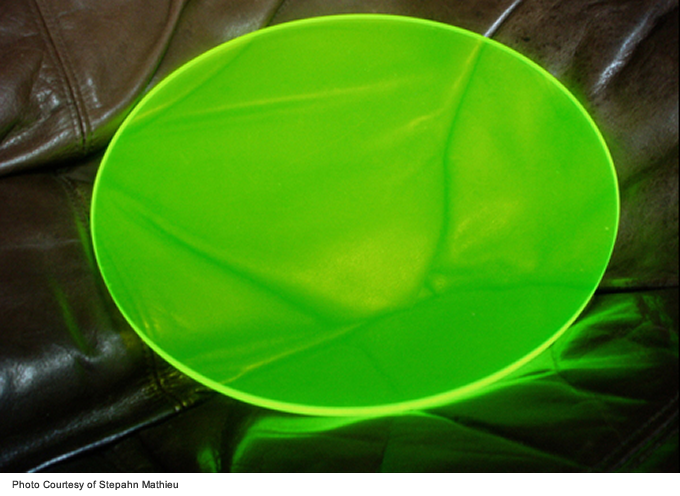 The material for A Static Place and Remain was created during one week in 2008. Back then I was looking into further possibilities for a live system I had been using for a year to process records from my collection of early 78s, playing selected records on two mechanical-acoustic gramophones to send them to my computer to be transformed in realtime. The basic processes involved are the same I had already used for Radioland, with the gramophone setup which I had already created the material for Transcriptions with, a collaboration with Taylor Deupree. My digital tools have hardly changed since a decade, I like to work with things I know and rather refine them with the years, get to know them better. The processes I’m applying to audio are dealing in the first place with the merging of different acoustic spaces in order to create a new, imaginairy space inhabited by the initial audio information which the project starts from. What is changing though are the input devices I use. I’m after an essence of sound, of the material or instruments I’m working with. Pia Bolognesi: Do you think there is a correlation between the artistic production of Schaefer and the strong architectural dimension of your set-up? 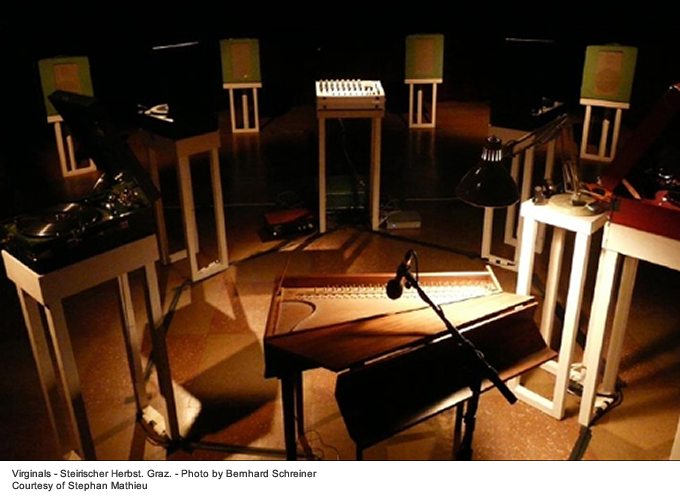 Stephan Mathieu: While things started to take shape with my gramophone system, I received Janek Schaefer’s Extended Play CD. Janek and I are friends and during that period we exchanged thoughts and feedback regading each other’s projects. So while I was already familiar with the concept for the Extended Play installation, actually hearing the recordings for the first time immediately striked me as his strongest, most touching work to date. Pia Bolognesi: As far as the differences between these two projects are concerned, for Remain you used original material from the installation Extended Play of Janek Schaefer, reprocessing the sound through different devices (entropic set-up, spectral analysis and convolution processes) built on a dinamic and introspective vision. 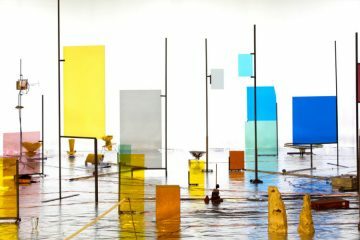 Can you tell us how did you work to the structure of Remain and how did you reprocess again the sound of Schaefer’s installation? 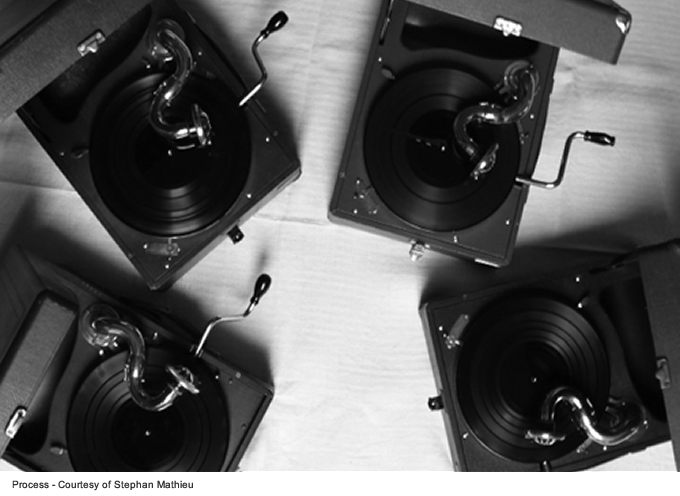 Stephan Mathieu: Apart from being a beautiful project for someone who loves music like me, Extended Play also gave me the opportunity to start working with my 78s. Rather accidentally I turned it into a personalised at-home installation, having up to four copies running in a loop in the house from various sources spread across three floors, creating a constantly changing version of Janek’s piece, reflecting his original concept of random recombination of a score for piano, violin and cello scattered in fragments across nine vinyl records. I made two long room recordings of this mix by setting up microphones in different locations in the house and then started reworking them using digital signal processing as well as a classic arrangement for audio entropy, which means ‘space-processing’ the sound by playing it back into your room, re-recording it from there, playing back the new recording, recording it again and so on, until all that is left is a glistening tonal band, filtered by your own space’s dimensions. Convolution  does something similar, but here things happen in an abstract digital space using complex algorithms. Although all this might sound very technical in the first place, to me it is quite a poetic way of working with sound. I also like the fact that these are both processes I can initiate but not fully control myself. Instead I feed audio into an autopoietic system. 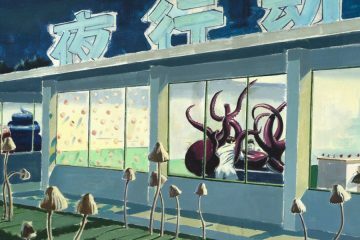 Stephan Mathieu: This is a result of the process described which is about space and duration, a flow. I look at Remain rather as an audio ‘state’ than ambient music. Pia Bolognesi: Coming back to A Static Place, for this project you rework a selection of 78RPM records from 1928-1932 of music from the late Gothic, Renaissance and Baroque period. How did you work on processing the original supports and what is the preparatory process for this specific kind of intervention? Stephan Mathieu: The process for A Static Place is very similar to the one for Remain, while convolution is more prominent in the 12k material. The two room recordings I used for Remain are replaced by selected records which are played back simultaneously from two mechanical-acoustic gramophones from the late 1920s, then they are picked up from the gramophone’s horns by microphones to be sent to the computer. Again both input sources are transfigured into a hybrid audio form that carries informaton of the tonal spectrum, dynamics, movements from the initial material. Pia Bolognesi: As sound artist and collector your work on pre-existent material is a very strong challenge between the respect of the originals and the creative determination to make a new work exploiting the potential areas of intervention that combinations of sounds can afford. In addition there is a very strong component which is found in A Static Place, a suspension of temporality that updates the composition and makes it timeless. What do you think about these aspects? 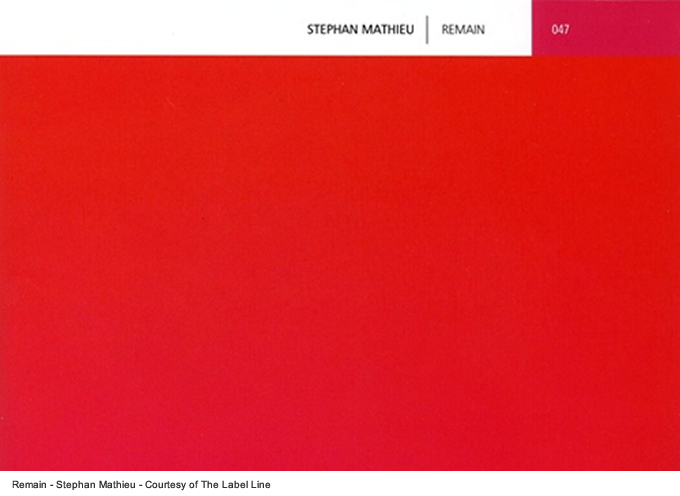 Stephan Mathieu: After I started making music with computers I soon reworked several pieces by friends, a collection that became the Full Swing Edits series, 10 tracks of highly abstracted versions of the originals. 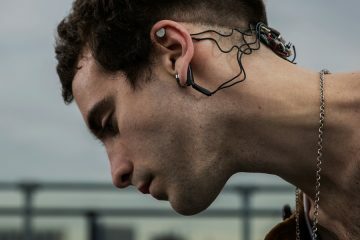 I was looking for something I thought of as a personal essence of the material, something that holds the artists working methods, their specific sound, trying to create an audio portrait of them. It’s the same I’m doing today whenever I’m working with material by others, they are always present while I’m at it. The aspect of suspended time might come from the places where I find this essence, from spaces within the tonal spectrum. Pia Bolognesi:During the past years you have collaborated with contemporary composers and artists: Taylor Deupree, Akira Rabelais, Janek Schaefer, Piotr Kurek, John Hudak, Claudio Sinatti and Caro Mikalef. Though they are very different projects all your works denote a formal canon, a painstaking search for every individual sound in harmony with the different personalities you work with. 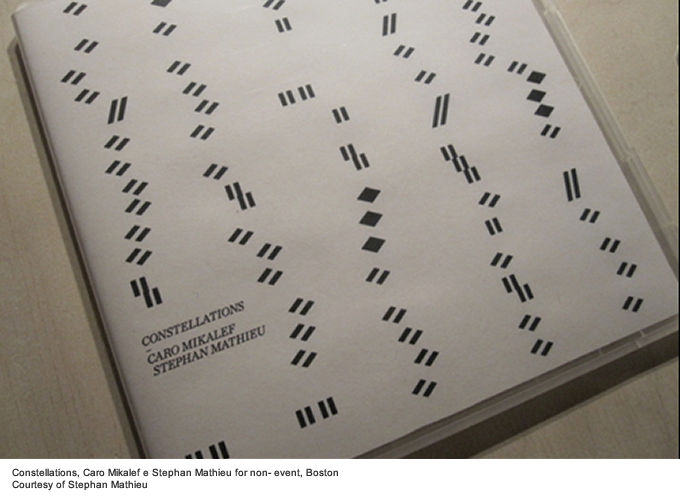 I refer to elective affinities with Taylor Deupree and Akira Rabelais, but also to Constellations with Caro Mikalef. As far as Virginals is concerned, how did you develop the project? 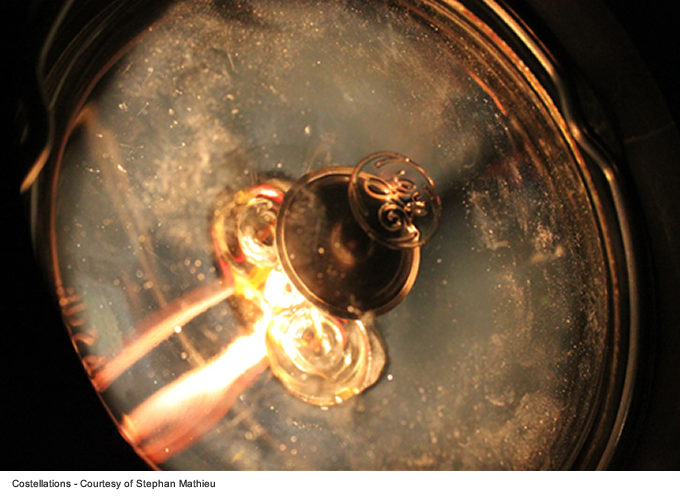 Stephan Mathieu: Virginals connects several points of interests for me, there’s my love for old music instruments, the ‘spirit’ within certain instruments and equipment, historical media and their use in the context of composing contemporary music, but also the act of interpretation of a written score. I only really discovered classical music for myself as a listener once I developed a sense for the different ways of playing it. I’m partiicularly touched by those who are able to play it in a unique and personal way.Then, I wanted to know more about the background of the compositions I like the most: what the context was back then, the composers’ and performers’ circumstances, politically, philosophically, scientifically, what their attitude was, which intruments were available, how they were made, how loud they were, what kind of ensemble was available at a certain royal court during a certain period, was there something like a vibrato in late Renaissance singing and so forth. I did a lot of reading, a lot of listening to all kinds of recordings and renditions. In the end I found several favourites, discoverd a lot of ‘new’ music, and obviously erased also a proper part of the pop knowledge I had, mainly because it wasn’t just early music I was learning about, but also street gospel, hillbilly, hawaiian guitar duets. So, while some years ago I could tell you the exact duration of Queens We are the Champions, I’m not sure anymore right now. Instead I can tell you on which day Blind Willie Johnson has recorded Dark was the night, cold was the ground now. A real data overflow. Apart from that I learned a lot about what interpretation means and how it can affect a composition, in a positive or negative way. At the same time I got interested in the “History of sound recording”, started collecting gramophones and specific records from around 1900 to 1930, the times before or during the dawn of electronical equipment like microphones or loudspeakers. While back then most classical music was performed in an ‘updated’, modern fashion, there are also some very few recordings from the first movement of a historically informed performances practice from this period, where instruments like the lute, viols, a clavichord were recorded for the very first time, played by people who cared about historical tunings, authentic instruments and all. Those recordings in many aspects opened a window with a wide view to me. An important figure in the revival of early music is Arnold Dolmetsch, a frenchman who moved to England and started researching early music in the 1880s, a time when everything older than 100 years was considered primitive, early attempts in music making. Dolmetsch started reconstructing long lost instruments, researched scores, performance practices, tunings from the Renaissance and early Baroque, started teaching, first his family members, then people who heard about him. Then one day one of his instruments, an Octave Virginal, sort of a small at-home harpsichord built in his workshop in 1952 popped up there and I managed to acquire it at a fair price. With the instruments’ arrival again several things fell into place for me and I began working on a series of special versions, personal interpretations of some of my favourite pieces by composers I admire, starting with Alvin Lucier and Phill Niblock whose pieces I transcribed for the Virginals, adding a version of Francisco López‘ Untitled ’92 played with four gramophones and after a while I was able to present an evening of contemporary music in a classical recital style. Next I extended the instruments by adding a vintage 6-channel loudspeaker system which turned out to be the perfect amplification for them. Also it enabled me to set everything up as an arrangement of ‘characters’ where the audience can walk within instead of being seated. 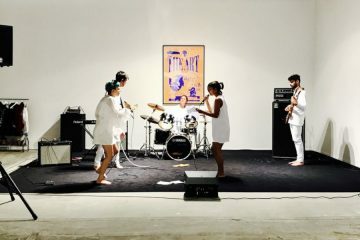 So the whole set became an organism that involves, reacts and actually relies strongly on the performance space and the audience as active players. People are free to move in the space, experience the sound sources from different positions, move closer to the sound they like the most and the acoustic spacial reflections come alive in a very special way. In the meantime I added two electronic organs to the ensemble and since a while I’m in touch with composers who are writing new works for it. So I’m quite exited to collaborate with Tashi Wada on a composition for Virginals right now, the piece will be premiered in a 14th century monastry in the center of Paris early in June. Pia Bolognesi: In your live projects there is a strong relationship between sound, visual and performance. What is the dimension that characterizes your live work differently from the process of creating for your records? 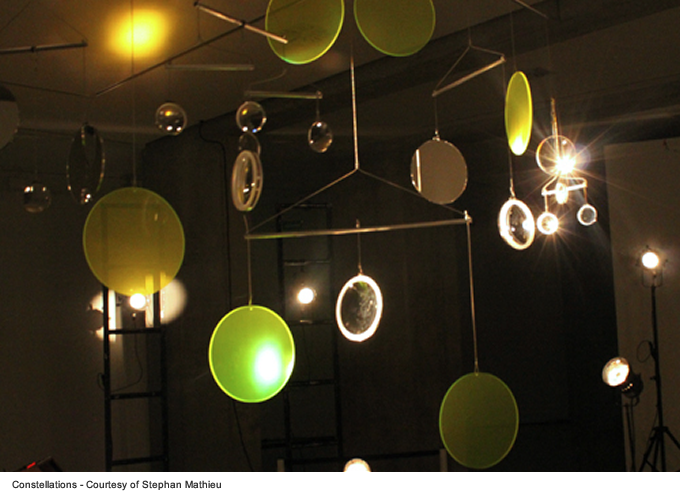 And how can the spazialization of sound in a visual experience influence the final result? Stephan Mathieu: Basically, the music making live is very similar to what I do at home since the same tools and instruments are involved. Some projects are more rough in a live context, especially the computer pieces which are based on realtime processes, without any preconcieved material. Then I started a while ago to present some more or less open compositions like Constellations, Process or Virginals which are in a way more safe to play. What matters most for me with electronic or electroacoustic music is the quality of reproduction of the audio, a good loudspeaker system. Apart from my own system used for the Virginals project whenever it is possible to travel with all the stuff, I found out that my music often works better with a rock backline, guitar and bass amplifiers, than with a classic PA, especially if the PA has more of a medium quality. I like to work with equipment that has character, it helps to carry the music. In general I try to avoid a frontal stereo situation for performances and go surround/multichannel whenever possible. Speaking of visual aspects, I started to develop concepts that go along with the mechanical approach which currently has a strong focus in my work. While I don’t believe that music necessarily needs a visual aspect, I had two invitations to create audiovisual pieces during the last 2 years. 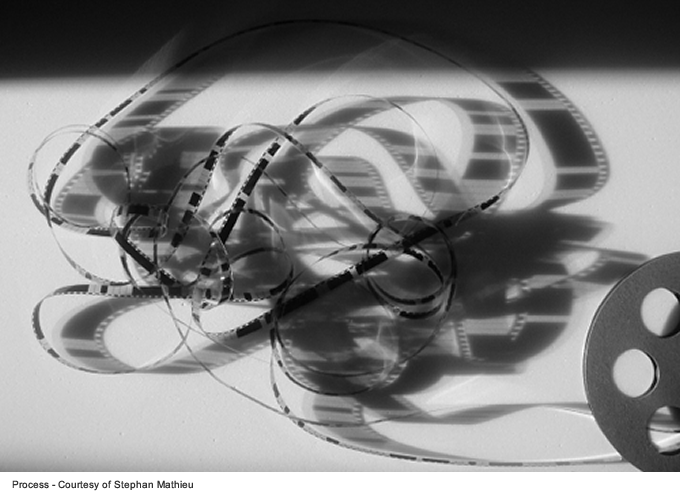 I wrote Process, a piece loosely based on Franz Kafka/Orson Welles’ The Trial which is performed with four gramophones, the virginals  and two 16mm projectors connected by a long black and white loop containing Kafka’s piece and Welles’images in binairy code. As well as Constellations, a collaboration with Buenos Aires based visual artist Caro Mikalef commissioned by Sonar Festival in Barcelona, which turned out to become a dedication to Renaissance composer Antonio de Cabézon, performed by the two of us playing the virginals with seven electromagnets while a large custom made device with optical lenses and colour filters throws spectral light into the space. I like to see what’s in there, where it leads me, what a performance can be. Pia Bolognesi: In conclusion, this is a very intense period for you, you have just released two records and you’ll be in Paris, Spain and Buenos Aires with two others different audiovisual live projects Radioland and Costellations, and we hope to have the possibility to see again Virginal in the next months. Can you tell us which are your projects and appointments in the future? Stephan Mathieu: Apart from the new pieces in progress for Virginals, there are a couple of other collaborations in the making right now. Musique Nouvelle (http://www.musiquesnouvelles.com),a contemporary music ensemble from Belgium, has invited me to create two compositions with them, in July I will meet for a week with Ensemble 0 (0sound.tumblr.com), an open group with Stéphane Garin, Sylvain Cauveau and Joel Merah at its core, to create a site specific piece. Also my dream of putting together an ensemble of early music players finally seems to come true, Caro Mikalef and I are about to finish a new version of the Process piece that we want to present later this Fall, and since a while Z’ev and I are discussing a rather chambermusical piece with each other. While these are mainly live projects, there are also some home listening productions in progress, a CD with a soundtrack I wrote for a stage adaptation of Gustave Flaubert’s novel Un Coeur Simple is nearly finished, recording parts of Virginals right now, collaborations with Sylvain Chauveau and Christoph Heemann are slowly taking shape. It’s a lot of exciting things to do, most of them progressing in parallel, and luckily there’s a lot of ‘ensemble’ work ahead instead of being solo. I’m very much looking forward to what the future brings. – Guy Debord , Mode d’emploi du détournement, Parigi 1956, in Nicolas Bourriaud, Postproduction. Come l’arte riprogramma il mondo, Postmedia Books, Milan 2004, p. 33. – Tecnica utilizzata da Mathieu per la spazializzazione del suono. – La strumentazione PA, è di solito usata coma “frontline” in modo da ridurre i problemi di feedback acustico, ed è posizionata in opposizione al sistema backline. – Strumento simile al clavicembalo, di dimensioni ridotte.